There are no doubts, that your WordPress site is the key to your digital marketing campaigns. It acts like 24/7 salesmen without any weekends or holidays. That is why customers can ask you for help anytime. According to the LivePerson’s Connecting with Consumers report, 83% of shoppers need some form of help for making a purchase. 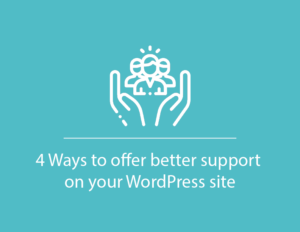 How to provide your site with a better support, read in our article. Why should we be concerned about better support? What the first thing that comes to mind when somebody asks you about customer experience? Maybe, it is a good UX of your site? Or maybe it is the speed of page loading? 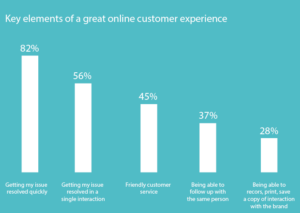 We agreed, that these issues also matter, but 82% of shoppers associate customer experience with the time of resolving their requests, and 45% with the friendly customer service department. Moreover, despite the popular expression, that ‘we all have gone online’, 77% of shoppers said, that they are likely satisfied with the in-store customer service, compared to 67% online. What are the main channels of customer support? Traditionally, the main channel of customer support offering on the site was an email. But with the rapid growth of technologies, it takes a back seat. Instant communication is one of the distinct features of the modern world. That is why many companies try to include not only an e-mail address or FAQ section, but also provide with the live chat and call center. According to a report by Forrester, in 2017 a number of customers, that use live chat over phone or email, have been showing an increase of 50% in the 5 last years. So, now let’s observe different ways how you can make better support for your online store or blog. Start with the live chat. As we saw above, people want their issues to be solved immediately. There is where the live chat plugin starts to really shine. 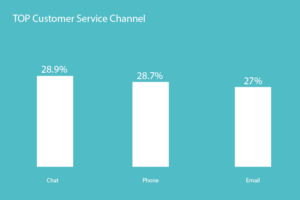 On average, consumers issues on chat are answered within 42 seconds. Chat is an incredible platform to connect with your customers in real-time, to identify all their pain points and to help quickly resolve them. To start using it just activate the plugin after downloading it from our website and upload to your plugin directory. Let’s create one live chat plugin for the e-commerce store. A lot of designers and developers make a huge mistake thinking that contact page is not necessary. But it is wrong. For a number of sites, the contact page gets the most views than any other page. It’s true, especially, if you run agency or contractors. Google maps enable your customers to easily find you. Wondering how to add it to the WordPress site? To make your life easier we developed a Google maps plugin with which you can easily set markets and locations with the text, images, categories, and links. In the video below you can see how to quickly customize the plugin. Create such forms using our contact form plugin. You can choose from a range of available templates and customize the design through the plugin builder. Suppose, I want to create a feedback form for my online store. See, how I will do it in the short video tutorial. Usually, customers address to you with the same questions on an ongoing basis. So it will be a good idea to design a special section, where you answer them publicly and prominently. To make your FAQ section more helpful and useful think about the questions which are really concerned your customers. Write these issues from your consumer’s perspective, for example, start the questions from “How do I…”, but answer from the business perspective: “You should…”. Another useful tip is to provide customers with images or a short video tutorial if it can explain the problem better than words. And the last point is to remember, that FAQs aren’t static section, which was created on the first day of your site. You should maintain and always update all the information. Today, the Telegram has 200 millions active monthly users with an annual growth rate of 50%. Bots in Telegram is a new feature, that businesses only start to explore. If briefly, bots are the applications that run inside Telegram and interact with users. So, people can send them messages, commands, and inline requests. Create a bot for Telegram not so hard, on the Internet, you can find a plenty of tutorials. The Telegram bot could become a good entry point for customers to learn about your company and solve different type of problems. As you can see the inbound marketing is starting to play a crucial role in a successful performance of your business, because of changing the consumer’s lifestyle and behavior.